Epelsa (2010) - ARM definitive issue. Mint annulled label. Epelsa (3.3.2010) - ARM definitive issue. Franking scale number EP000003. Cover, inland mail (0,34 EUR). Postal indexation. Epelsa (3.3.2010) - ARM definitive issue. Franking scale number EP000003. Cover mailed to UK (0,64 EUR). Postal indexation. Epelsa (3.3.2010) - ARM definitive issue. Franking scale number EP000003. Cover inland mail, mixed franking with one ARM stamp (0,10 EUR) + one ATM (0,24 EUR). Postal indexation. Epelsa (3.3.2010) - ARM definitive issue. Franking scale number EP000003. First day cover, inland mail (0,34 EUR). Postal indexation. Very few pieces. Epelsa (3.3.2010) - ARM definitive issue. Franking scale number EP000003. First day cover, international mail - Europa (0,64 EUR). Postal indexation. Very few pieces. Epelsa (3.3.2010) - ARM definitive issue. Franking scale number EP000003. First day cover, urgent inland mail (2,75 EUR). Very few pieces. Epelsa (3.3.2010) - ARM definitive issue. Franking scale number EP000003. Cover, urgent inland mail (2,75 EUR). Epelsa (2010) - ARM definitive issue. Franking scale number 0003. Mint adjust label. Epelsa (3.3.2010) - ARM definitive issue. Franking scale number EP000008. Cover, inland mail (0,34 EUR). Postal indexation. Epelsa (3.3.2010) - ARM definitive issue. Franking scale number EP000008. Cover mailed to UK (0,64 EUR). Postal indexation. Epelsa (3.3.2010) - ARM definitive issue. Franking scale number EP000008. Cover inland mail, mixed franking with one ARM stamp (0,10 EUR) + one ATM (0,24 EUR). Postal indexation. Epelsa (3.3.2010) - ARM definitive issue. Franking scale number EP000008. First day cover, inland mail (0,34 EUR). Postal indexation. Very few pieces. Epelsa (3.3.2010) - ARM definitive issue. Franking scale number EP000008. First day cover, international mail - Europa (0,64 EUR). Postal indexation. Very few pieces. Epelsa (3.3.2010) - ARM definitive issue. Franking scale number EP000008. First day cover, urgent inland mail (2,75 EUR). Very few pieces. Epelsa (3.3.2010) - ARM definitive issue. Franking scale number EP000008. Cover, urgent inland mail (2,75 EUR). Epelsa (3.3.2010) - ARM definitive issue. Franking scale number EP000008. First day postcard (0,34 EUR). Only 11 pieces, numbered. Epelsa (3.3.2010) - ARM definitive issue. Franking scale number EP000009. Cover, inland mail (0,34 EUR). Postal indexation. Epelsa (3.3.2010) - ARM definitive issue. Franking scale number EP000010. Cover, inland mail (0,34 EUR). Postal indexation. Epelsa (3.3.2010) - ARM definitive issue. Franking scale number EP000010. Cover mailed to UK (0,64 EUR). Postal indexation. Epelsa (3.3.2010) - ARM definitive issue. Franking scale number EP000010. 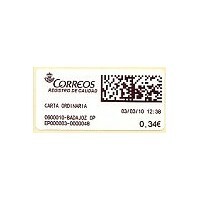 Cover inland mail, mixed franking with one ARM stamp (0,10 EUR) + one ATM (0,24 EUR). Postal indexation. Epelsa (3.3.2010) - ARM definitive issue. Franking scale number EP000010. First day cover, inland mail (0,34 EUR). Postal indexation. Very few pieces. Epelsa (3.3.2010) - ARM definitive issue. Franking scale number EP000010. First day cover, international mail - Europa (0,64 EUR). Postal indexation. Very few pieces. Epelsa (3.3.2010) - ARM definitive issue. Franking scale number EP000010. First day cover, urgent inland mail (2,75 EUR). Very few pieces. Epelsa (3.3.2010) - ARM definitive issue. Franking scale number EP000010. Cover, urgent inland mail (2,75 EUR).